Richard Bright: Can we begin by you saying something about your backgrounds and how you came to work together? Burton Nitta: We met at the Royal College of Art (RCA) where we both studied on the MA Design Interactions course. A common concern between our work was centred on challenging preconceptions of our humanness and the systems we live within. We worked as individual artists following graduation from the RCA and started collaborating together in 2009 when we found we were looking at similar interests yet our alternative cultural lenses gave intriguing perspectives on these interests. Michael Burton: I grew-up on a farm in Cambridgeshire, UK. It was this immersion in the countryside, which helped catalyse an interest in science and art. There was a choice in which educational path to follow between art or science. 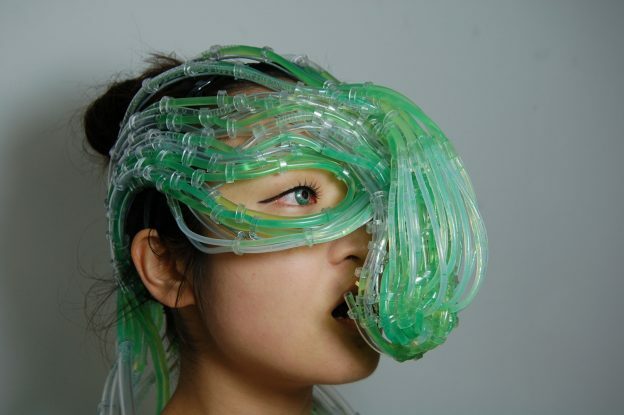 Inspired by artists such as Eduardo Kac, Stelarc and Orlan when considering a Fine Art Sculpture degree, the freedom of art was particularly appealing where the construction of an interdisciplinary practice could include science research alongside artistic creativity. Michiko Nitta: I grew up in Tokyo, Japan. Similar to Michael there was a choice of which path in education to take either science or art. With a mother working in the Japanese animation industry and with a great interest in anime, manga and gaming culture, it was a natural progression to fuse art, design, science and technology when commencing a career as an artist/designer. 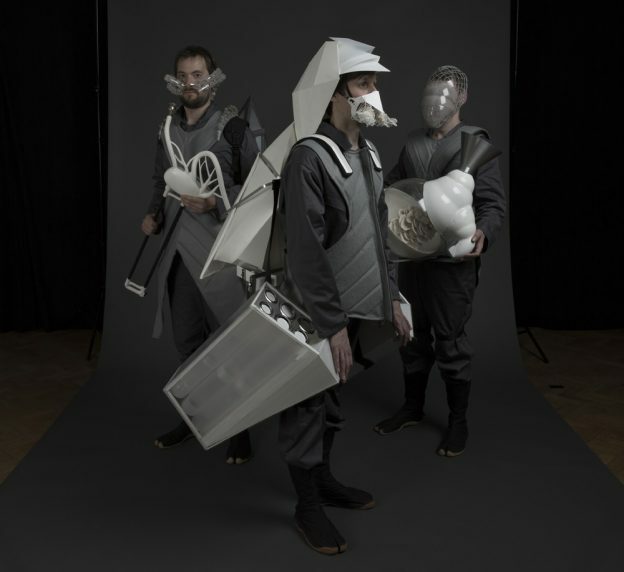 BN: Whilst at the Royal College of Art, the work of Anthony Dunne and Fiona Raby (the Design Interactions course leaders) and their discourse of Critical and Speculative Design was a big influence on us. artists: Matthew Barney, Carsten Höller and Pipelotti Rist. BN: Two underlying questions drive our work: who are we (as humans now)? Who or what will we be in various versions of the future? We are fascinated by how our human desires for the future can reveal insights into the human animal or human condition. We don’t attempt to predict the future and don’t believe there is one version of the future. We hope to navigate complexities and observational viewpoints in the many parallel versions of the future. In imagining the possibilities, our pursuit to identify patterns, counter narratives, we touch on discourses that include technological development, quantum physics and theories around the multiverse. BN: Work we create invites audiences to imagine alternatives, to themselves and to the world. The pieces aim to highlight and explore the dislocations between the messy complexity of our physicality/cognition and place within the world, in contrast to the self-perceptions that we carry with us. There are particular strands of research and alternative models of ourselves that inspire us. For instance, the ‘Human Super-Organism’ that considers the network of bacteria, fungi and other microbes creating the whole human body. The ‘Gutbrain’ that attempts to understand how the resident community of gut bacteria influence our thoughts and behaviour. Our artworks investigate human futures and evolutionary paths influenced by emerging and disruptive technologies. So our work is not so much a prediction of the future or solution to issues of the day, but instead invites audiences into a space to explore the endless opportunities that can shift according to our desires and dreams. BN: The ‘embodied embedded self’ along with philosophical theory, such as that researched by Andy Clark at the University of Edinburgh on the interplay of brain, body and external world, is a concept we are currently exploring. We are particularly interested in the reconceptualisation of the parameters of the body within time and space axises. Within our collaboration we often come-up with systems and titles that aim to capture abstract concepts and fix them within a discourse so we can ‘sync’ our minds and discuss them. We think this is probably common across collaborative practice when working across disciplines. These placeholders help to make ideas that are ‘fluffy’ or indistinct, into something tangible and relatable. One such term that we invented for this reason is the ‘Transformosphere’. The conceptual framework was born out of a previous project called Instruments of the Afterlife. Very loosely, the Transformosphere transverses scales (time, size, process, assembly and entropy) and possibilities for transformations. We are always looking for convergences within our Transformosphere model. We consider one tangle within the Transformosphere reimagines the Mind. Photo by Lenka Rayn H.
Underlying conceptual enquiries in our research considers the ‘embodied embedded self’ and is a growing concern for us. In pieces such as Landscape Within, (funded by Wellcome Trust arts award) and its extension to current projects, we pursue the questions ‘who are we’ and ‘who or what will we be in the future’. This project in particular revealed a complex tangle of influences that form ‘us’. BN: Current work we are developing increasingly looks at ‘brain computer interfaces’ (BCI) that will revolutionise communication and biofeedback, which in turn will transform how we see ourselves. RB: You have frequently collaborated with scientists. Can you say something about your working process and are there any particular problems that have arisen when you have created artwork in laboratory/science settings? BN: Every collaboration and relationship is different. There is an underlying fascination with sharing discourses, alternative visions, expertise and knowledge. We aim to work in transdisciplinary ways and open our ideas to other disciplines – such as scientists, technologists, other artists, musicians, performers – so we achieve richer responses in art pieces. Some of the challenges experienced through collaborative ways of working includes the differences in language and discourses regarding specialist research. However this creates an opportunity to find ways of explaining and relatable ways to communicate research to a wider public audience. RB: Can you say something about your work Algaculture? What questions do you want to address in this work?